The Salvation Army (TSA) feeds, clothes, and empowers those in need throughout the year. However, during summer, demand for the organization’s services increases as most school-sponsored food programs end with classes. Food bank inventory typically starts to dwindle around the same time. In a charitable sector with fewer donations - but larger amounts - to go around, TSA needed to boost one-time July donations year-over-year to sustain its activities throughout the summer. Donors tend to give when they feel a personal connection to a cause, but Canadians were becoming detached and dismissive to ours, perceiving that TSA mainly focuses on helping the homeless. Canadians think less about poverty in the summer than in winter, when harsh conditions serve as an effective reminder. The nation was turning its collective attention to Canada 150 celebrations: news outlets would be busy covering Canada 150 as marketers rolled out #Canada150-themed campaigns. What initially stood as an obstacle became a creative catalyst: Canadians love to think of their country as the best place in the world to live. This is not a perspective shared by the less fortunate in Canada, where one in four seniors are living in poverty, one in five Canadians are skipping meals to make ends meet, and one in four households are paying more than they can afford for housing. 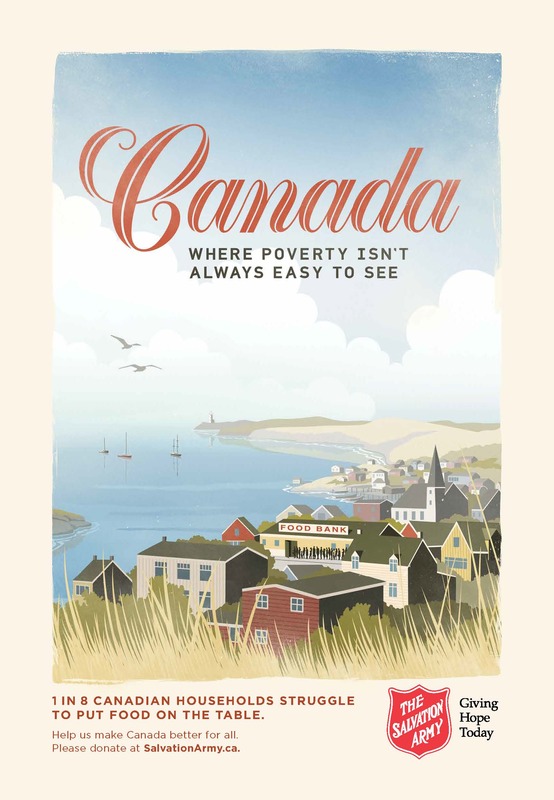 With national poverty rates not improving in the last decade, the excitement around Canada’s 150th anniversary – especially its celebratory nature – revealed a powerful truth: Canadians live in such a great country they can’t see its poverty. The team saw an opportunity to create cultural tension by revealing a side of Canada that Canadians fail to think about. 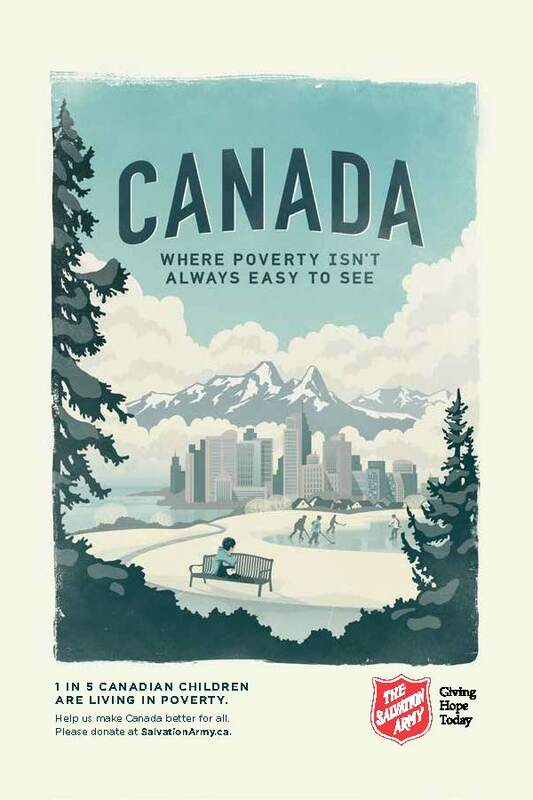 The Salvation Army and agency Grey Canada joined the Canada 150 celebration by inviting Canadians to engage with a tourism campaign with a twist: exposing the reality of poverty hiding behind our nation’s greatness. Real Canadians were taken on a bus tour experience, highlighting the beauty and wealth of our country as well as its hidden poverty. To expand reach, their reactions were captured as part of an online film, pushed on social with a cut-down pre-roll version. The bus tour guide’s presentation was used to create radio commercials, bringing the organization’s message to a mass audience during their commute. Traditional-looking tourism adverts in print, out-of-home, and digital banners further highlighted the hidden aspect of poverty. To go deeper into how poverty hides in the country’s greatness, a virtual tour offered Canadians to explore cities, markets, parks, homes and schools, and reveal their hidden poverty. Each execution leveraged the celebratory nature of Canada 150 to reveal an unexpected side of Canada’s reality. Demonstrating the hidden side of poverty behind Canada’s celebration-worthy greatness allowed TSA’s message to break through: the online film was shared over 5,000 times, generating over 2.7 M views. The campaign was also picked up by dozens of online news outlets. But most importantly, the campaign drove one-time donations: website donations in July grew 106.3% YOY, while call center donations grew 249.5% YOY. 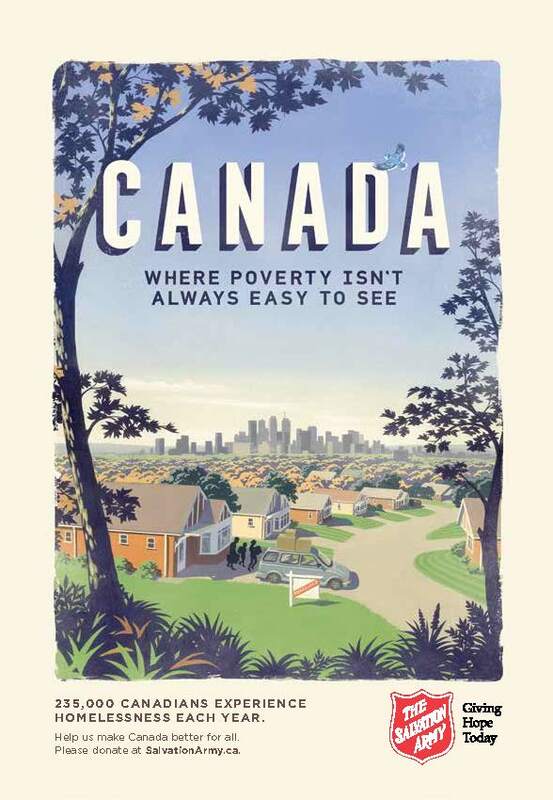 At a time when everyone was celebrating Canada, “The Canadian Discovery Tour” got people talking about issues surrounding poverty. The team’s approach generated sufficient new donations for TSA to pursue its mission through to the rest of the year.